In this article John tells of the road that took him from a parking lot repair session to the podium at national awards ceremonies in Sebring, Florida. There have always been sports cars: After graduating from college I had had several Triumphs, Saabs and an Alfa Romeo GTV6. My wife Judy and I regularly went to sports car races including the Watkins Glen Grand Prix where she, being an autograph hound, got signatures from Jim Clark, Sterling Moss and Pedro Rodriguez. These I donated to the International Racing Hall of Fame in Watkins Glen after her passing. In 2000, I was working on my Alfa in the parking lot of my mechanic friend Mark. I invited Judy along as I knew Mark had a blue 928 he was selling. It was parked only a few spots away. I asked Judy what she thought of the Porsche: her response was, “Oh I love that car”. The price was right, so naturally we bought it for her to use as a street car. It was a 1984, 928S with an automatic transmission and around sixty-five thousand miles on the odometer. Judy particularly liked the 4.7 liter V8 rumble around town. The 928 was driven sparingly in the summer for a few years- until the day my son asked, “Dad, did you know you could take the Porsche on race tracks?”. 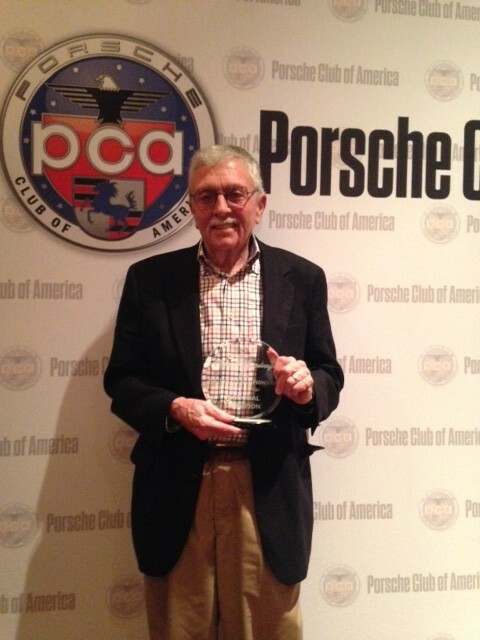 He said we could join the Porsche Club of America and enter Driver Education events, which we subsequently did. You may be able to guess we got hooked. Our first event, sponsored by the Connecticut Valley Region, was at Lime Rock Park. My son and I shared the car which meant only two runs on track for each of us. After registration, tech inspection and the driver’s meeting, we were raring to go. It had rained and the track was wet for my first run. My instructor was none other than Dan Jacobs, the eminent Porsche repair/restoration/racer expert in Connecticut. Without much urging from Dan, I was pretty cautious (read slow) as he taught me about the “line”- turn in, apex and track out. Having missed the first apex in Big Bend on one lap, I recall Dan saying, “ Well, we’ll send that one a post card.” Once, at the beginning of the front straight, Dan said, “John, you don’t have to brake at the top of the downhill”, with emphasis on the word top. The track was dry on my second run in the afternoon and I did much better. After that first Saturday DE event, my adrenaline levels didn’t return to normal until Tuesday. My son and I shared the 928 over the next couple of years, doing over twenty track days each season on tracks including Lime Rock Park, Watkins Glen International, Monticello Raceway and New Jersey Motorsports Park. Thanks to our outstanding instructors, we became advanced drivers, my son achieving the status of red run driver and PCA instructor. Through all our track time, our Porsche ran flawlessly. The car is wonderful on track at speed, very stable, rotates readily and has 50-50 weight distribution. The engine and transmission (made by Mercedes in those years) are durable and reliable with a new aluminum radiator with a transmission oil cooler the only maintenance work done over the years. Over time, we upgraded the brake pads, installed headers to allow the 928 to breathe better, ran softer compound tires and stainless steel brake lines. There were very few other 928’s running in these DE events and I never saw another one with the four speed automatic transmission I enjoy so much. Interestingly, during my early events, my instructors suggested I brake with my right foot, even though I had always used my left foot on the brake in an automatic transmission car- the result of an accident on the farm in upstate New York where I was raised. My right ankle was broken when I was kicked while milking a cow. At the time, I owned a ‘52 Ford with standard shift; so, I learned to put my right foot, which was in a cast, up on the transmission tunnel and use my left foot on all three pedals, including the brake. It became natural and automatic to me to brake with my left foot. Eventually, my instructors saw the benefit of my technique and allowed me to switch back to my left foot. My logic is that I have two pedals to operate and two feet to do so. I never even think about it. Not surprisingly, my son soon desired his own car. He bought a normally aspirated track ready 1983 Porsche 944, that had been raced successfully, from a PCA member who was looking to upgrade to a GT3. Over time, he improved his car with Hoosier track tires, some suspension modifications and a better racing seat. He added a driving suit and shoes and a few other upgrades familiar to all track drivers. In 2013 my son tried Club Racing. Graphics were added to his 944 that captured the look of the Martini and Rossi cars of the 1970’s. With his car needing little else to be acceptable for Club Racing, he competed at Lime Rock, Watkins Glen and Summit Point, West Virginia. It was a learning year- no “incidents”, but also no podium finishes in his SP2 class. The car didn’t fare as well: after his last race, the engine decided it was tired and showed no oil pressure. The car engine may have died [that winter it was rebuilt by Blaszack Engineering in Canada] but not my son’s enthusiasm. His last race over, he said, “Dad, you have to try Club Racing, it is a wonderful adrenaline rush.” I began accompanying him to events, trying to help with tire pressures, oil level- wherever I could lend a hand. With a feeling for excitement of club racing, I took my car to Rick Dobush at R&D Motors in Albany in early 2014 and asked him to make whatever modifications were necessary to Club Race. Previously he upgraded my suspension to double the spring rates, installed a roll bar, racing seats and a five point harnesses. While I was getting my PCA Racing License, Rick added a removable steering wheel, window netting, converted the roll bar to a full cage, and added a transponder and electrical kill switch. In mid April, my 928S was ready to go racing, but at age 76, was I? According to the rules, I was to race in Class C, whatever that was. Turns out it’s for generally older model Porsches, whose weight to horsepower ratio is between 14 and 16 lbs./HP. There aren’t many cars in Class C and even fewer 928’s running in PCA Club Racing- nearly none with automatic transmissions. In 2014, my son and I raced at Lime Rock, Watkins Glen, Mosport and Summit Point. In mid- summer, region co-racer Chris Clapper called to tell me I was in the national points lead in Class C; until that call, I wasn’t even aware of the National Points System. By the end of the season, I completed six races. I not only won a Workers Choice Award but also the 2014 national Class C championship and was honored at a dinner in Sebring, Florida along with other class podium finishers. In 2015, with a title to defend, my son and I started the racing season at Lime Rock in late April. It was snowing as we pulled into the track. Fortunately, it cleared for the next day’s practice and qualifying and for the Saturday races. My son’s 944 ran perfectly and he drove well, securing a second and a third in class in the two races. I finished both races but after the checkered for race one, I managed to lock up the right front wheel going into Big Bend. My car decided it didn’t want to slow before it kissed the tire wall. I had to be towed from the mud and as the next race was ready to start, I was going around the track, flat spot on my tire, thumping all the way back to the pits. Talk about being embarrassed. A quick inspection by Dan Jacobs, a tire change, and a bit of duct tape and I was ready for race two. With lots of renewed focus, I finished the race cleanly and had two point races under my belt at the end of the day. For the remainder of 2015, my son was working on a new business so he didn’t attend any more races. I competed alone and cleanly finished additional points races at Mosport, New Jersey Motorsports Park and Summit Point. At Summit Point, my last race was my first one hour enduro. At some point during the hour, each car must make a 5 minute pit stop; but, the driver can choose when to come in. This was one of the most enjoyable races I’ve done . Compared to the sprint races, there’s a bit less pressure. During the five minutes, drivers can get a drink, go to the bathroom, or grab a snack. Regardless of the type of race, it’s always a bit of a relief to get the checkered flag at the finish and give a thumbs up to all the corner workers. In 2015, I was fortunate to receive two more Workers Choice Awards, one at Mosport and one at Summit Point. With six clean point races, at the age of seventy-seven, I was again named Class C National Champion. It is a tribute to Porsche Engineering/Design that this 30+ year old original car can, over a two year period, complete twelve stressful races without a single mechanical issue. It is also a tribute to the PCA, their safety equipment requirements, their annual driver physical forms, their national Club Racing Staff, and the track volunteers to make it all work so flawlessly. I have been asked why I do such a dangerous thing at my age. My answer is usually threefold. First, because I can. I’ve been blessed with good health and I have been able to withstand the rigors of car preparation, changing wheels, the cockpit heat and other physical stress. Also, since my beautiful wife died of lung cancer the day after our 50th wedding anniversary, I am proud to drive her car on track and display the white “fight lung cancer” sticker. The second reason I race is to be with my son in events that we enjoy so much. His wife Rachael calls us both “car nuts” which I guess is correct. I couldn’t afford a Porsche upon graduating from college so I bought a Triumph. I still have a 72 TR6, but my love is Porsches and I have one for the track-and one for the street. The third reason I do Club Racing is the fun, the cars and the people. Just seeing well over a hundred Porsches fitted out for racing at any event is eye candy at its best. The models, the colors and the sounds are tremendous. Unfortunately because of the intense competition, some are seriously damaged while racing, but thanks to PCA’s emphasis on safety personal injuries are rare. And, the people, from other drivers to officials, are friendly and go out of their way to help. Several PCA officials have assisted me in mechanical, weight, and other issues that could have resulted in a disqualification but were attended to with their help. So, are we having fun yet? The answer is a resounding YES. With more seat time and race experience, rookie nervous energy turns to a more confident adrenaline excitement. Strapped into the race seat with the safety harness and surrounded with a roll cage and wearing a helmet, HANS device and fireproof clothing, sitting in your place on the starting grid never gets old as each race and each track are different. When the grid workers give the one minute signal, some forty Porsches, including mine with that beautiful aluminum 4.7 liter V8 with headers and straight pipe, roar into life. As cars enter the track behind the pace car, an official splits the racers into two lines. After a pace lap or two, the pace car pulls off, the green flag is waved and, like NASCAR races, it’s two cars abreast- GO,GO,GO. After the pandemonium of turn one, cars spread out. You try to drive the racing line while watching your big mirror; with several classes of cars in each race, faster cars come up behind very quickly. Class C is usually the slowest class; so, my goal is to allow faster cars to pass safely, post lap times faster than qualifying, keep the car on the track, finish the race (every race has several DNF’s or Did Not Finish) and see the checkered flag. Is it fun just competing in a race, finishing cleanly- even if it’s far down the finishing order, and getting the checkered flag? The answer is “big time fun”, especially if there are other racers in the event that you know. I’ll be heading to Sebring, Florida again in February to receive my 2015 championship trophy. I’ve had the good fortune to finish six national points races in both 2014 and 2015. I attribute my success to consistency on the track, the mechanical durability of the 928, the preparation work of Rick Dobush at R&D Motors in Albany and, perhaps a little divine intervention. I think Judy is up there somewhere looking down to ensure I don’t mess up her nice street car.